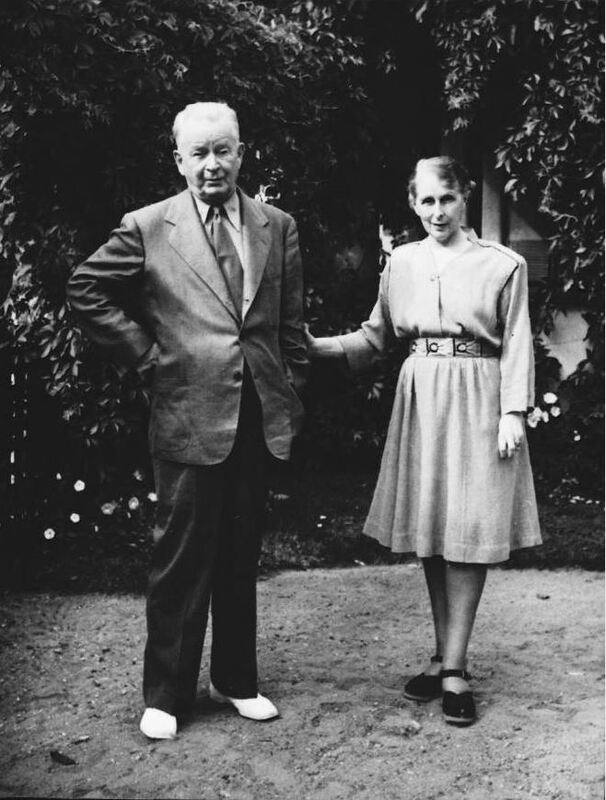 Between 1925 and 1939, the Saarinen family made annual trips to Europe, always stopping for a time in Finland. They travelled by sea, usually departing from New York and arriving in Southampton, England or Gothenburg, Sweden. When they sailed directly to Scandinavia, they were abaord the MS Gripsholm. The MS Gripsholm in New York City, c. 1951. Courtesy of the Museum of the City of New York. 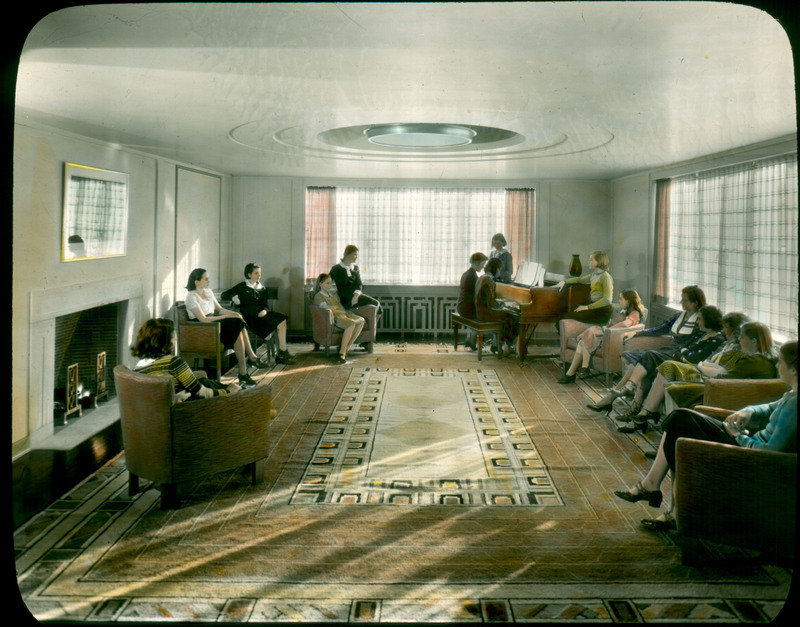 Aboard the MS Gripsholm, first class passengers enjoyed all the traditional features of luxury transatlantic liners (libraries, writing rooms, gyms, a pool, garden rooms, smoking parlors, bars, etc. ), along with distinctly Nordic options, like folk dancing, Swedish foods, and a fully Swedish crew. Eliel, Bob, Bobby, and Pipsan aboard the MS Gripsholm, 1929. Courtesy Cranbrook Archives. On this same trip, a photograph of Pipsan and little firework Bobby was sent back stateside and ran in the local papers here in Oakland County. 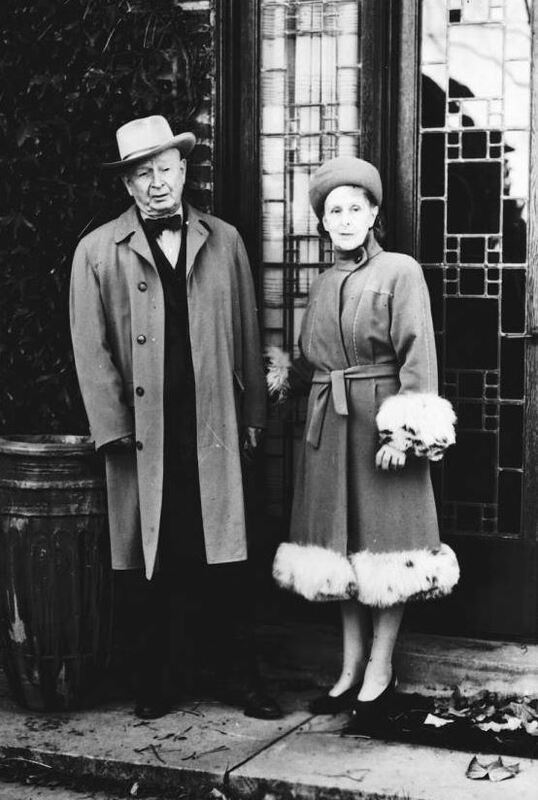 Pipsan is shown in a fashionable dress and hat, quite possibly of her own design, as at the time she was head of the Academy of Art’s short lived Fashion Department. 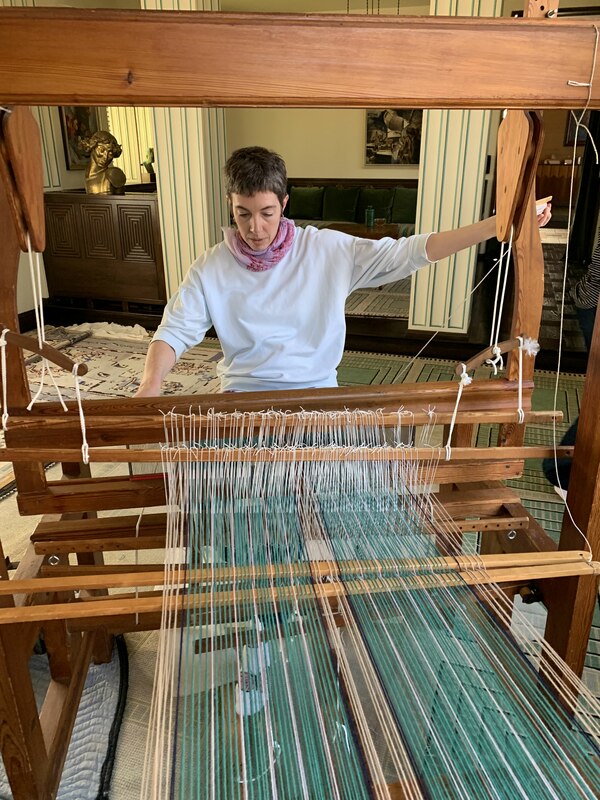 Pipsan, like her mother, made many of her own clothes throughout her life. In the Cranbrook Cultural Properties collection, we have the Saarinen’s steamer trunks and suitcases that they used aboard the Gripsholm and other ships. One of the suitcases has its stickers from the MS Gripsholm, still prominently called out in the Swedish pale blue and yellow. During World War II, when the Saarinen’s remained in the States aiding the U.S. war effort and organizing the Finnish Relief Fund, the Gripsholm was charted by the U.S. as a repatriation ship. It carried German and Japanese citizens to exchange points for U.S. and Canadian citizens. Gripsholm (and her neutral Swedish crew) made these exchanges at neutral ports, including Stockholm, Lisbon, Portuguese Goa, and Lourenço Marques. Over 12,000 Americans who had been in enemy territory at the outbreak of war or were prisoners of war returned home aboard the Gripsholm in this diplomatic capacity. In 1954, SAL sold the Gripsholm to a German company. She was rechristened the MS Berlin and entered into service as a Canadian immigration ship, sailing from points in Europe to Pier 21 in Halifax (the Ellis Island of Canada). The ship was retired and scrapped in 1966, but an image of the Gripsholm (in her Berlin livery) lives on in the Canadian passport! Copies of the Saarinen’s letters sent from the Gripsholm, photographs of the family about the ship, and the trunks and suitcases used by the family are all currently on view in “Saarinen Home: Living and Working with Cranbrook’s First Family of Design” in Saaarinen House, open for tours Friday and Saturdays at 1pm and Sundays at 1 & 3pm through the end of July. 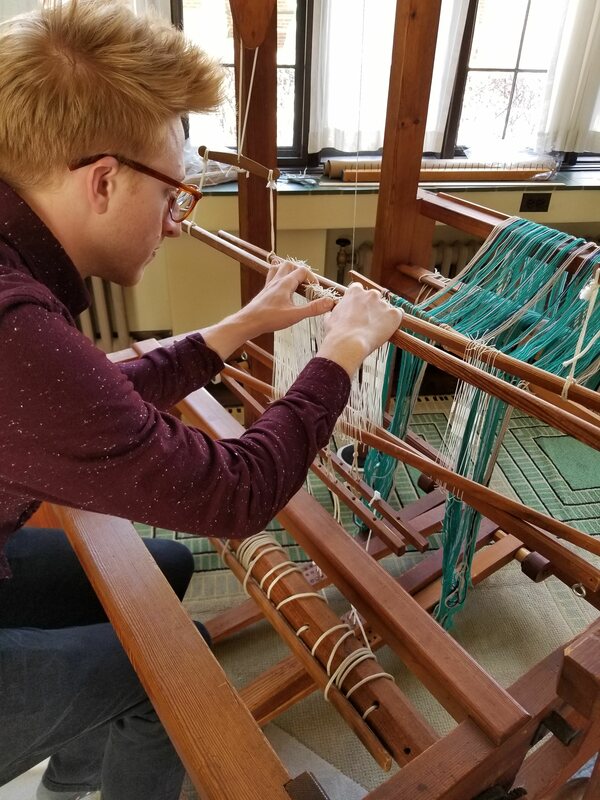 Tonight is our last Finnish Friday, where there is an open house at Saarinen House and games and cake in its courtyard, also, the Cranbrook Art Museum will be open; there are Finnish-related treasures out in the Archives Reading Room; and a cash bar on the Peristyle. Come on by for our last Finnish Friday! 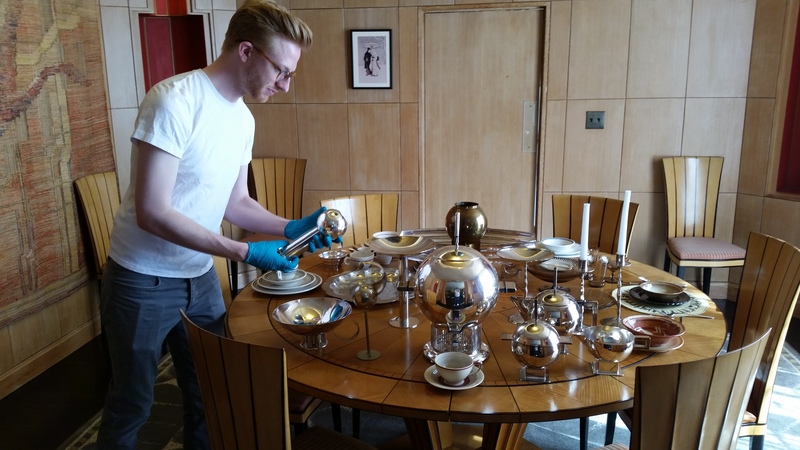 Cranbrook Center for Collections and Research “elves,” with help from the Cranbrook Archives and Cranbrook Art Museum, have worked their magic to bring out treasures designed for this summer’s reinvigorated and expanded tours of the landmark Saarinen House. 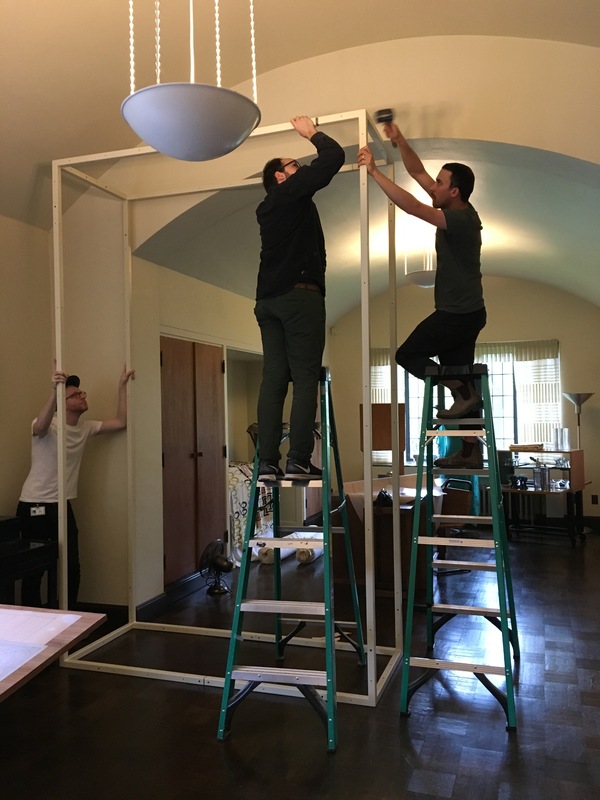 This three-month installation entitled Saarinen Home: Living and Working with Cranbrook’s First Family of Design, expands on the life and work of the remarkable Saarinen family, displaying items used in their home, at Cranbrook, and for projects around the country. Selecting sliver, glass, and ceramic items for the exhibition. The exhibition kicks off with an Open House from 1-4pm this Sunday, April 30th, during the Art Academy’s OPEN(STUDIOS). It will also be open for four nights of special programming – “Finnish Fridays” – the first of which is May 5th. Normal tours of the exhibit are Friday, Saturday, and Sunday, May through July. For all the details, check out the Cranbrook Center for Collections and Research website. 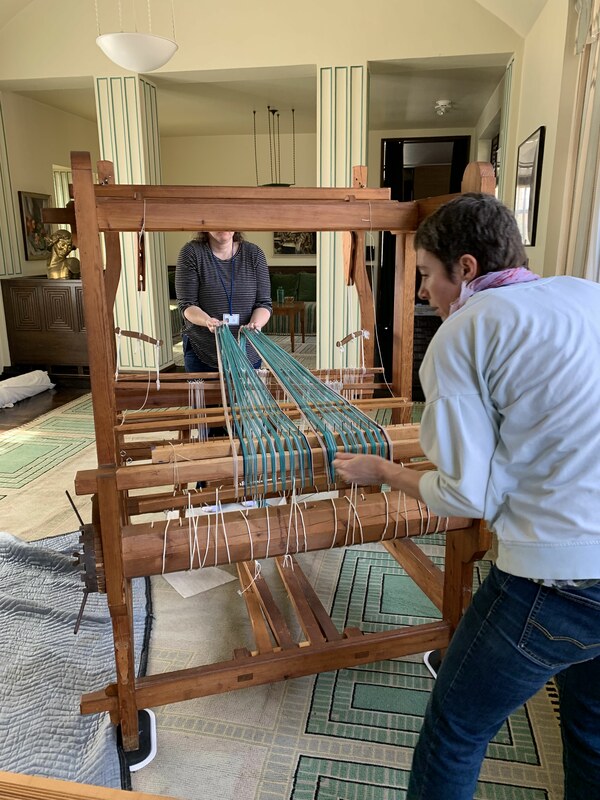 Preparing the space to display weavings by Studio Loja Saarinen. Eliel Saarinen taught his students to always consider how the design of one object fits within the next largest context; the building within the city plan, the furniture within the room, down to the fork on the table. Kingswood School for Girls embodies this philosophy, and is considered a “total work of art” designed by the Saarinen family. 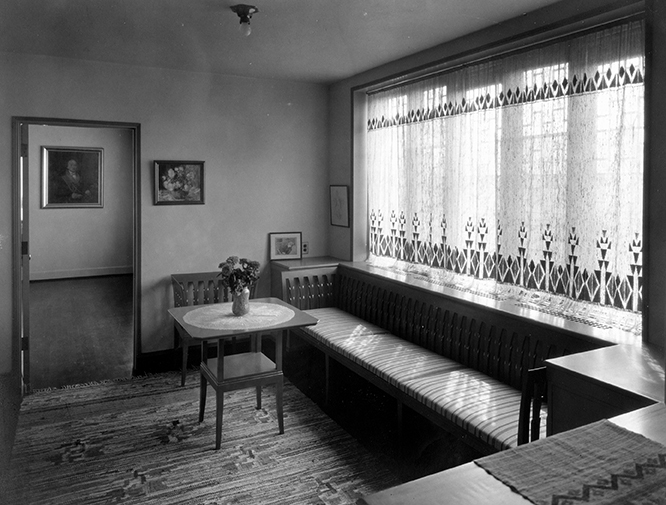 But that doesn’t mean the Saarinens designed everything in the building: Eliel knew when to delegate, not only to his wife Loja, daughter Pipsan, and son Eero, but also to others, like rugs and fabrics in the school designed by Studio Loja Saarinen weavers Maja Andersson Wirde, Lillian Holm, and others. Instrumental in decorating the school, Loja Saarinen also used her design eye to choose existing wares from the market to compliment the environment being created at Kingswood. The 1938 Kingswood School Cranbrook Inventory of Equipment and Supplies is full of entries like this one from May 1934: “Voucher No. 5547, Nessen Studio, Inc., 18 Nut Dishes for Kingswood School (ordered by Mrs. Saarinen).” The flatware in the Kingswood Dining Hall is another prime example of an existing design used to complete the Saarinens’ vision. The International Silver Company was a conglomerate of New England silver producers formed in 1898. Subsidiaries of International Silver, like Rogers Bros. and Wilcox Silver Plate Company, continued using their marks on works created under the new organization. 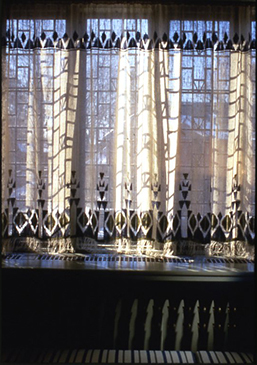 The silver-plate pattern selected for the Kingswood School for Girls dining hall was the International Silver Company’s “Silhouette” pattern. 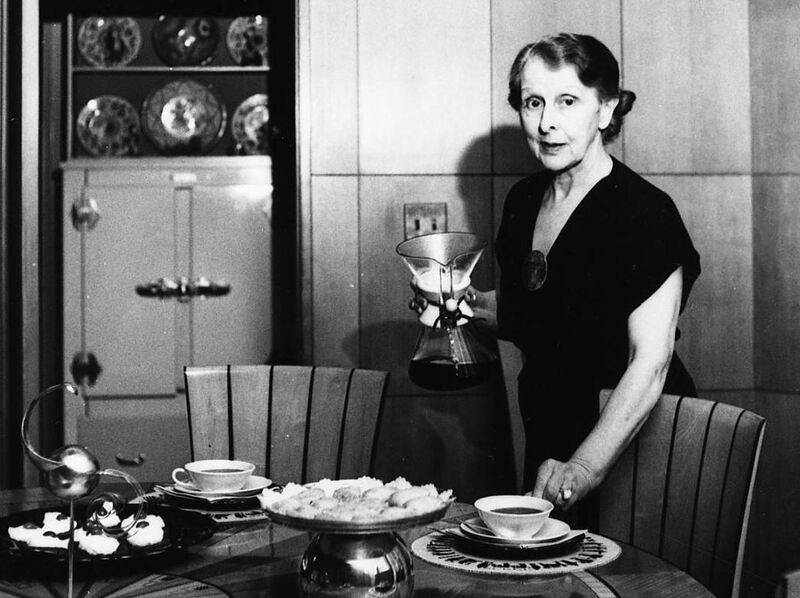 Though Eliel Saarinen collaborated as a designer with International Silver on a number of projects—including his famous Tea Urn and Tray—the “Silhouette” pattern was designed by Leslie A. Brown, who held a number of design patents while working for International Silver Company. “Silhouette” was produced under both the International Silver Company name and the 1847 Rogers brand. Advertisement from Hotel Management, Volume 17, Issue 6 (June 1930), Section 2, page 365. The ladies of Kingswood used these beautiful pieces on Saarinen designed tables, with plates from the Syracuse China Company (hotel ware division) with a Saarinen-designed Kingswood School crest on them. Dinners at Kingswood were formal affairs, so there were many pieces to each complete set of flatware. Detail from an image of the Junior-Senior Banquet at Kingswood School, June 1941. Notice the “Silhouette” flatware, the crested serving ware, and the Saarinen-designed Silver Centerpiece (KS 1991.1). Courtesy of Cranbrook Archives. Viande fork (top of page), butter spreader, and bouillon spoon from the Cultural Properties Collection, Kingswood School for Girls. Courtesy of Cranbrook Center for Collections and Research. The flatware was used for everyday dining as well as more formal dinners, but as dining at Cranbrook became less formal and the student body increased in size, more utilitarian commercial-grade knives, spoons, and forks were introduced. Luckily, we still have many of these original pieces in storage for study and display. Leslie S. Mio is the Assistant Registrar for the Cranbrook Center for Collections and Research and the Cranbrook Art Museum. One of my favorite parts of my job as an archivist is assisting researchers with locating materials in our collections. Often times a scholar will visit here with a set plan for their research project, and pre-conceived ideas about what they might find here or how the materials in our collections will support their thinking. One of my personal pleasures is when the researcher finds something new or surprising in our collections that changes their course of action. This is exciting on many levels – for them as well as for me! Maja Andersson Wirde (standing) with Loja Saarinen, Studio Loja Saarinen, ca 1930. 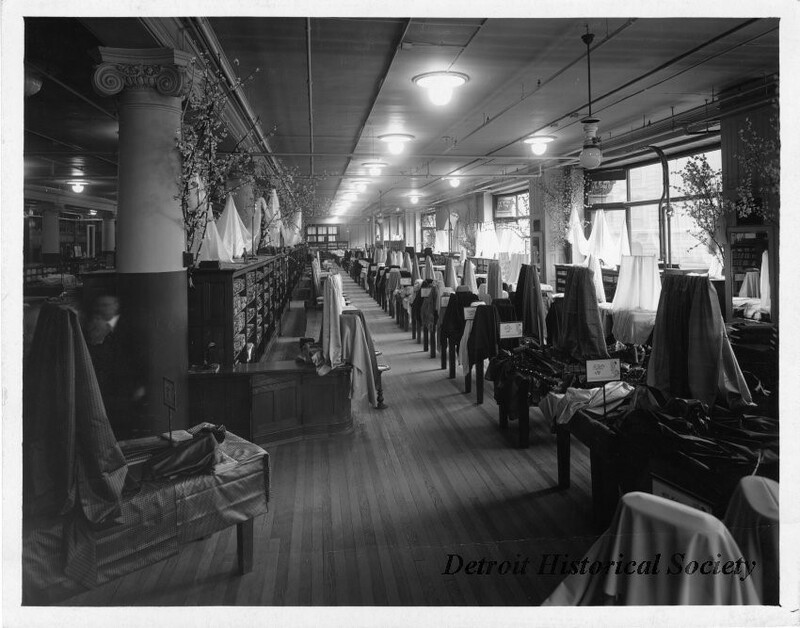 Detroit News photograph, Courtesy Cranbrook Archives. 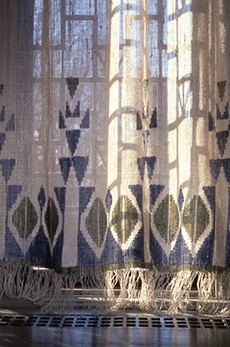 Prior to coming to Cranbrook, Maja Andersson Wirde had been employed by Handarbetes Vänner (The Friends of Handicraft) in Stockholm from 1907-1929. 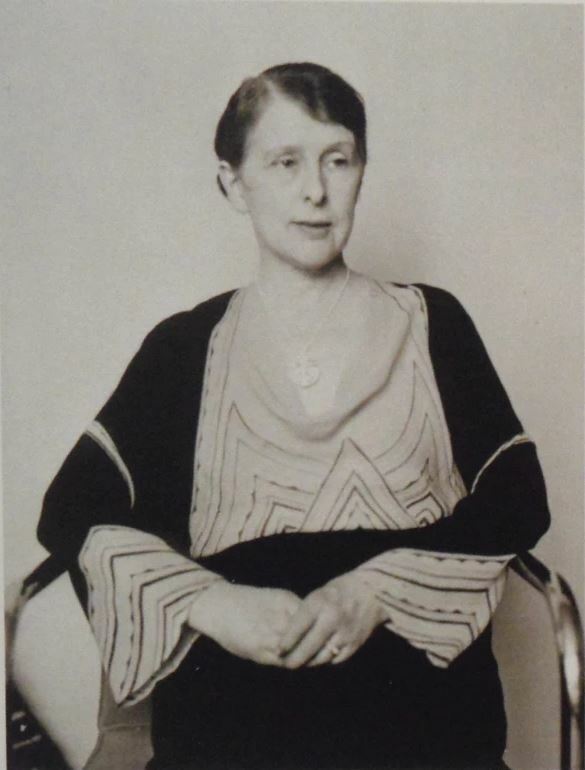 Her textile designs were represented in international exhibitions including Stockholm (1909 and 1930), Malmo (1914), Gothenburg (1923), and Paris (1925). However, according to Marie Andersson, Wirde’s “time spent at Cranbrook must be looked upon as the most important period” in Wirde’s life as an artist, and she created some of her most significant work while here. 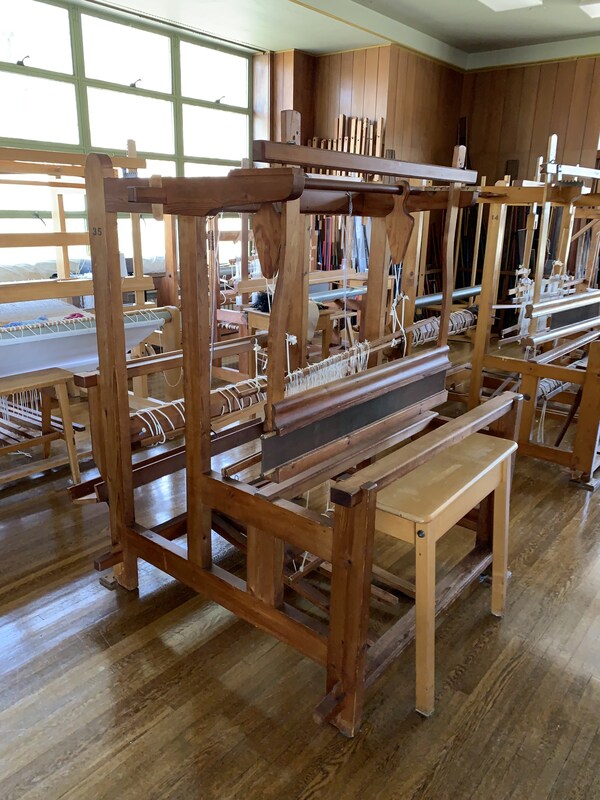 So, what did Marie discover at Cranbrook Archives? Comparing photographs and documents from our collections with images of watercolor sketches from museums and archives in Sweden, Marie and I spent two days of “fantastic co-operation” in order to uncover the extent of Wirde’s contribution to the history of textiles at Cranbrook, particularly Kingswood School. 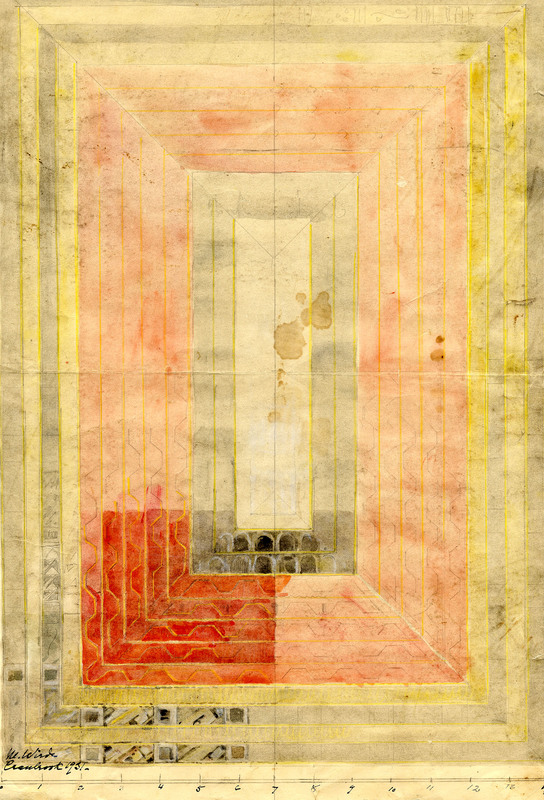 Watercolour sketch by Maja Wirde (1873-1952), Collection of Smålands Museum, Växjö, Sweden. 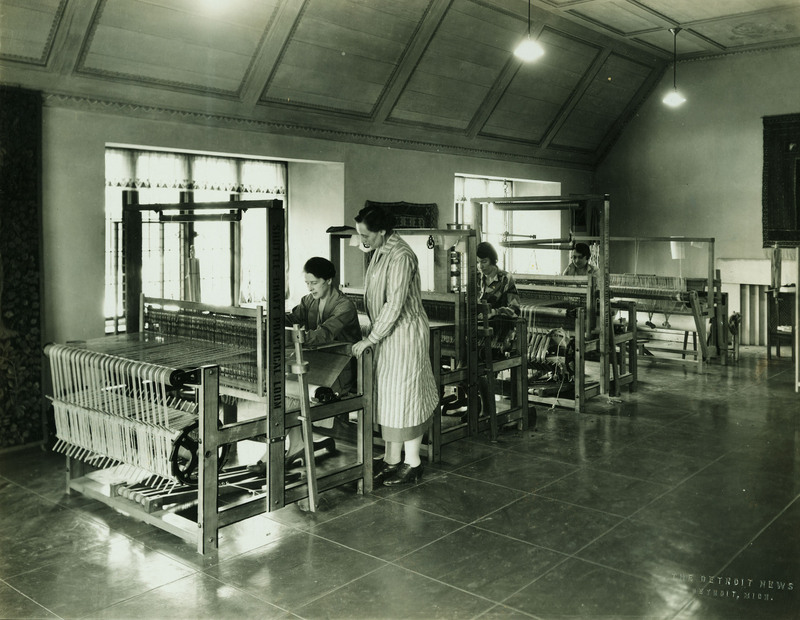 The rug for Reception Room III (Rose Lounge) in situ, Kingswood School, 1932. George Hance, photographer, Courtesy Cranbrook Archives. 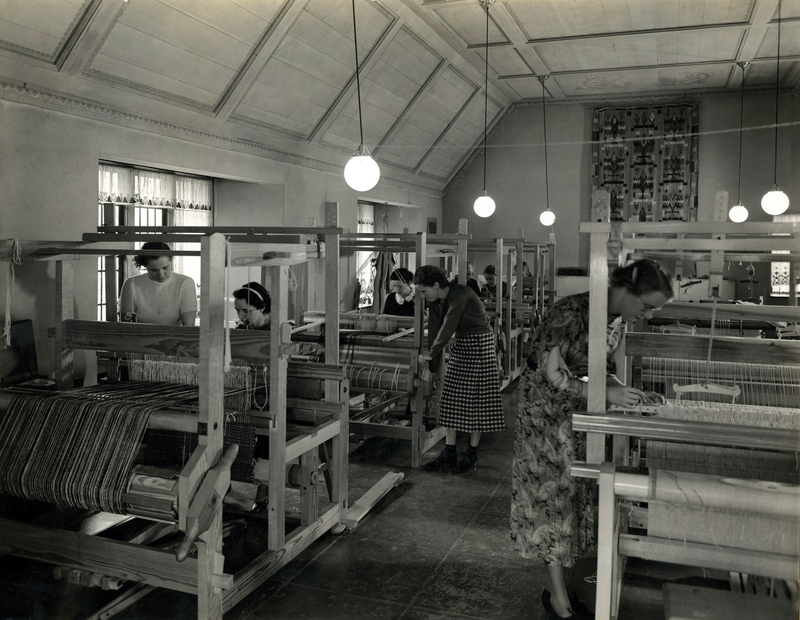 Prior to Marie’s visit, Wirde was known for her work as the shop supervisor at Studio Loja Saarinen, the weaving instructor at Kingswood School, and for her designs for several rugs and textiles for Kingswood School, including the fabric for the dining hall chairs and most notably, the large rug for the Green Lobby. 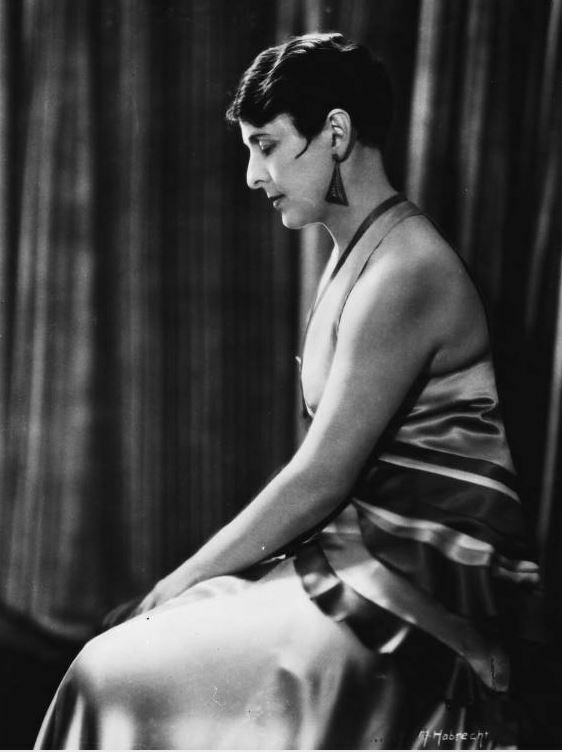 However, Loja Saarinen was given credit for the rest. 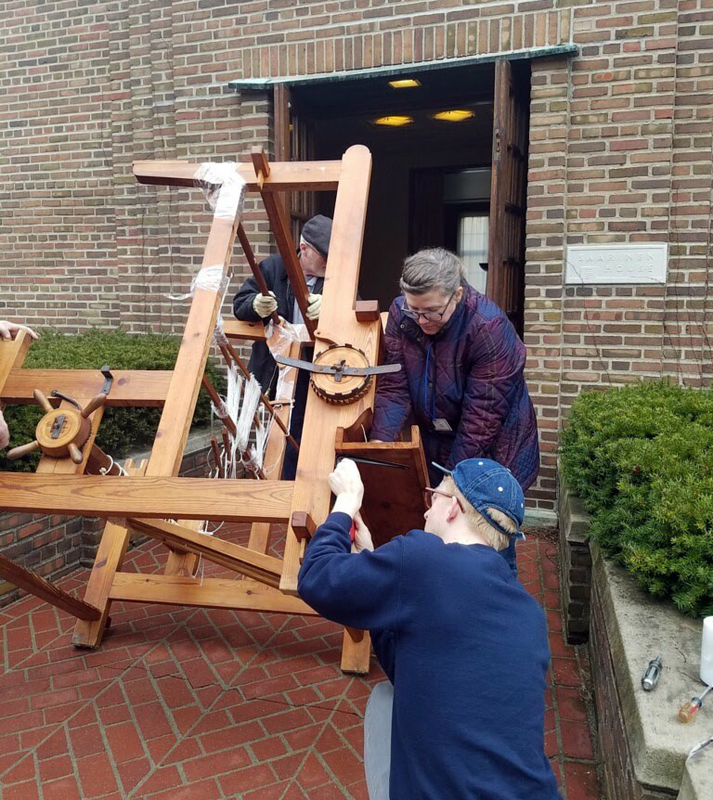 Now, Cranbrook can tell a more inclusive story – for we discovered that it was Maja Andersson Wirde who designed the majority of the textiles for Kingswood School – eleven rugs for lobby/reception halls, all of the curtains and rugs for the dormitory rooms, as well as curtains for the dining hall, study hall, and library! 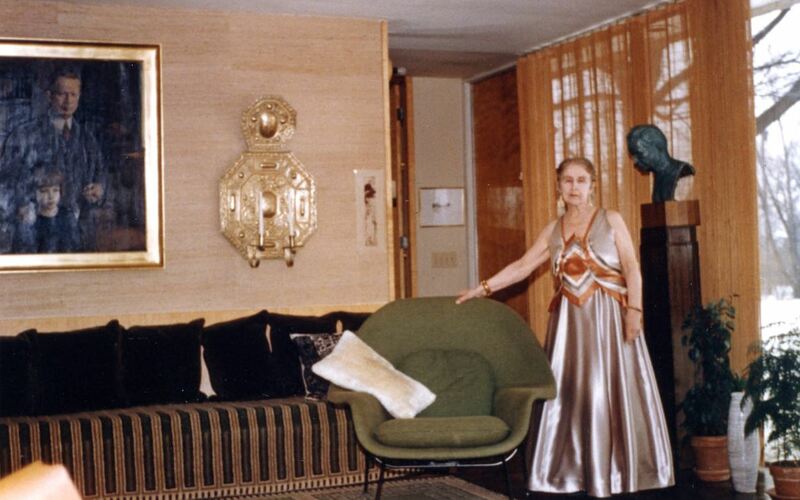 In addition, she designed rugs for the Academy of Art, Saarinen House, and George Booth’s Cranbrook Foundation Office. 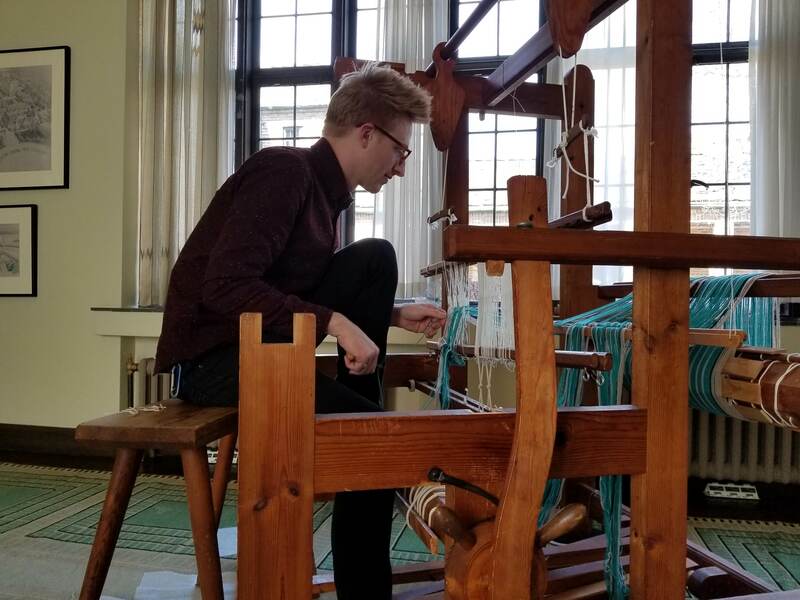 While the book, “Trådar ur ett liv: textilkonstnären Maja Andersson Wirde” was published pirmarily in Swedish, there is a translation of the chapter on Cranbrook in the back, and the book features numerous images from Cranbrook Archives. 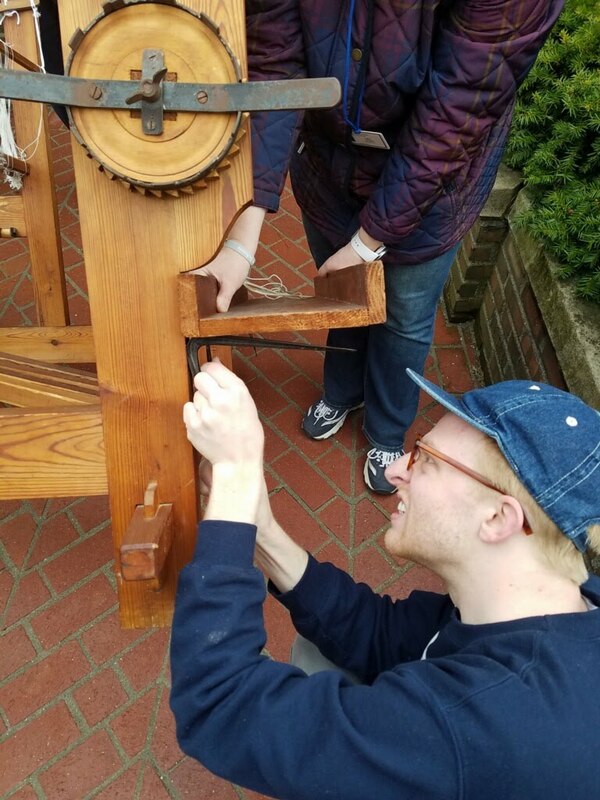 We are so excited to be able to tell a more comprehensive story not only about the objects in our care, but also a key individual in our rich history. Can You Say Lobster Roll? It feels as though summer is winding down and this week is the final session of Cranbrook Art Museum Summer Camp. We enjoyed a visit from students earlier in the week who were part of the “Costumes and Characters” session. While pulling materials to show the students, we came across this photo of Ralph Russell Calder (1894-1969), an architect and friend of Henry Scripps Booth. 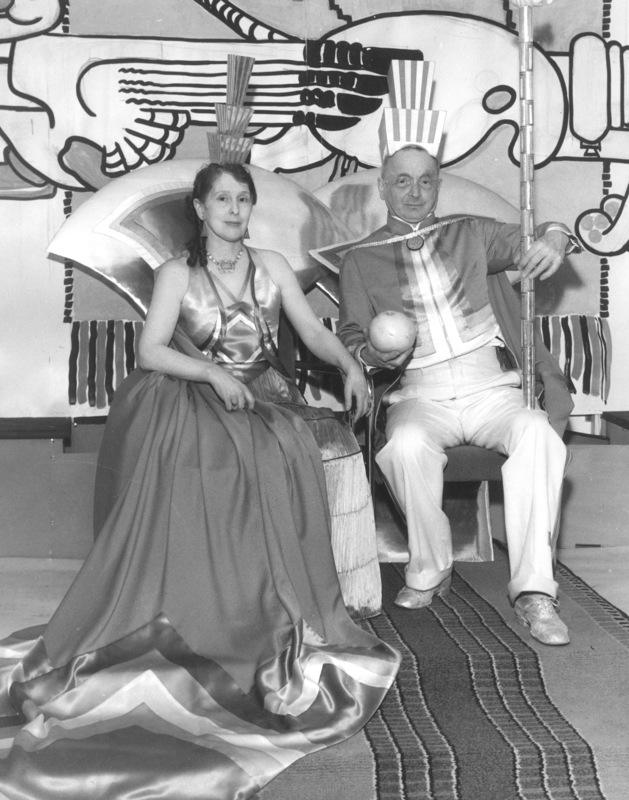 He is in a lobster costume made by Loja Saarinen for a “May Party” in 1926. From the Henry Scripps and Carolyn Farr Booth Papers, Cranbrook Archives. Calder, born in 1894, was a veteran of World War I and an accomplished musician. He graduated in 1923 from the University of Michigan College of Architecture (he and Henry were classmates). In 1924, he studied in England, France, and Italy as the winner of the George G. Booth Traveling Fellowship in Architecture. 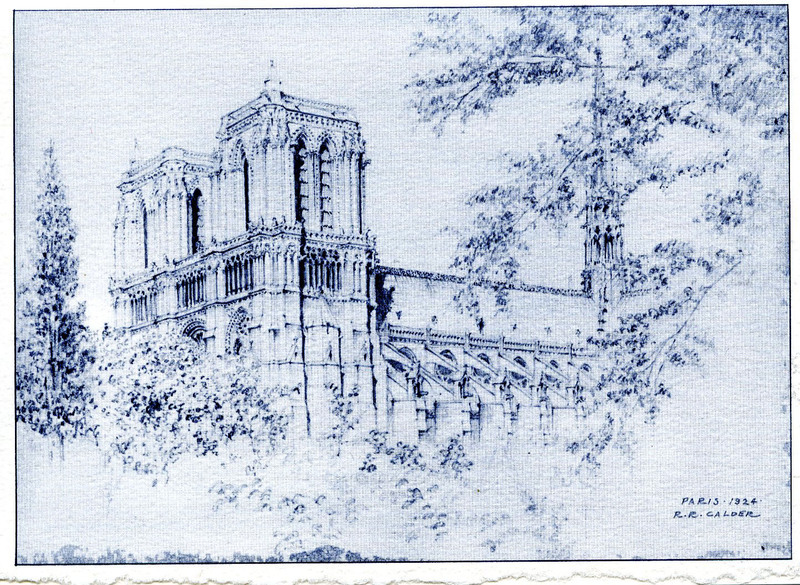 A card from Ralph Calder & Associates, Inc. with a 1924 sketch by Ralph Calder during his travels in Europe on the Booth Traveling Fellowship. 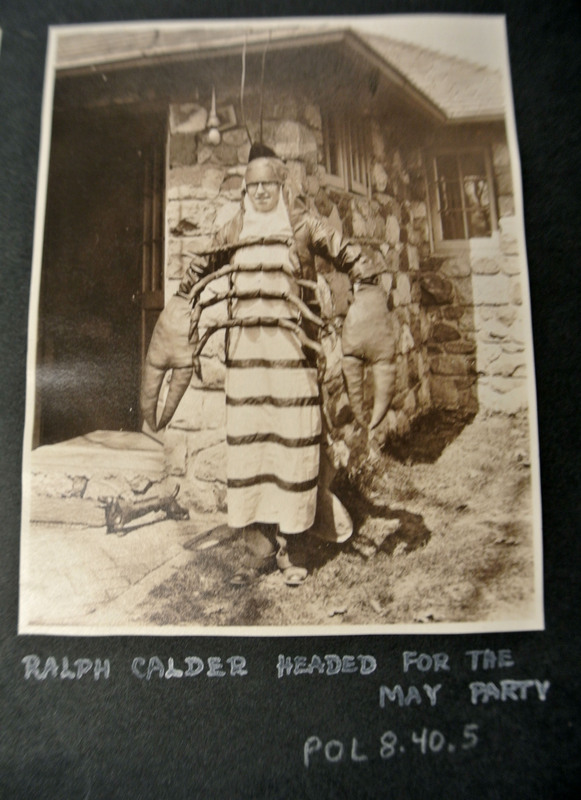 In 1925, Calder worked for several months as part of U of M’s Near East Research Expedition in Tunisia. 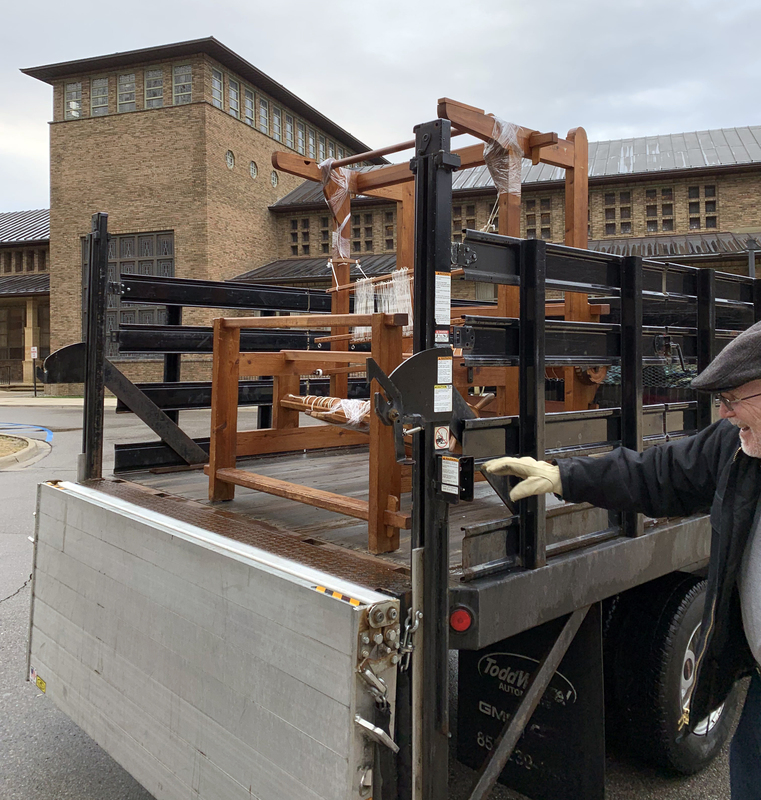 The research and objects obtained from this expedition are the basis of the collection at the Francis W. Kelsey Museum of Archaeology at U of M. Calder joined the Cranbrook Architectural Office in 1926 and remained there until staff was reduced due to the economic depression. In 1937, he joined the firm of William G. Malcomson and Maurice E. Hammond where he stayed until 1945, when he started his own firm, Ralph Calder and Associates, in Detroit. Calder worked on the following buildings on the Cranbrook campus: the main academic building (Hoey Hall) at Cranbrook School, Thornlea, and Thornlea Studio. 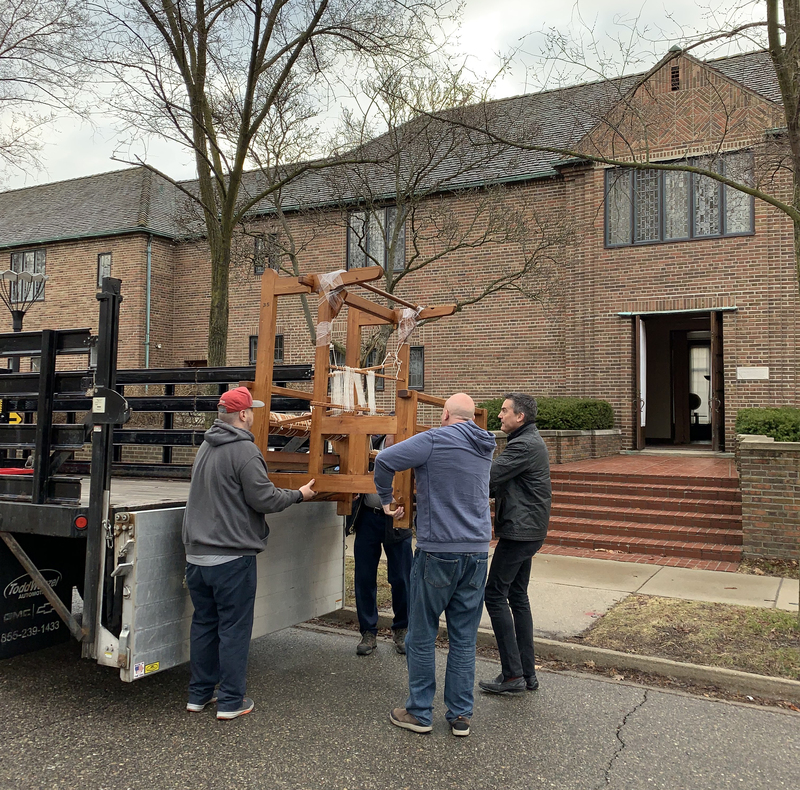 In addition, he was the architect for buildings at Michigan State University, Michigan Technological University, Hope College, Northern Michigan University, Hillsdale College, Wayne State University, Ferris State University, Western Michigan University, and Lake Superior State University. He enjoyed music as a hobby and was the organist and choirmaster for St. Paul’s Episcopal Cathedral in Detroit in the 1940s.